Annie works as the Student Services Program Specialist and Explore Week Coordinator at Eagle Rock. This means that on any given day, you can catch her facilitating team building initiatives, leading restorative circles, whipping up deliciousness with Culinary Enrichment students, helping student leaders implement campus-wide events, overseeing Explore Week classes, and having dozens of conversations. 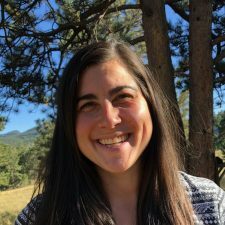 Prior to Eagle Rock, Annie studied nursing, spent 4 years facilitating outdoor education and team building experiences for folks of all ages and backgrounds, and most recently worked as a DONA certified birth doula and opened a center for birth education and family wellness in the Baltimore area. Annie’s background in direct individual, family and group support prepared her incredibly well for the variety of support and care she offers to Eagle Rock students on a daily basis. Annie loves adventuring with her wife and dog, making things, and having intense conversations. Students inspire me when they choose to leave what they know to move somewhere new and reclaim their lives.